There are 2 shops proposing this game for download at an average price of $ 19.99. Mixing card game mechanics with arena-style fighting action, this is a deliciously bonkers game which is worth picking up for the sheer fact that you can fry a rat with a beam of pure light, if for no other reason. The game takes that classic science fiction trope of a futuristic game show, as seen in the Killing Game Show and Running Man, where the player finds themselves a contestant and must battle their way to victory for the amusement of the crowd or die facedown in the dirt, knowing that their life was meaningless. The gameplay itself revolves mostly around the arena-combat which sees you battling off against a variety of opponents with a range of characters. 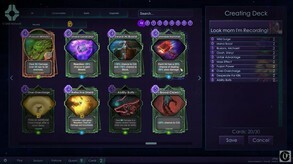 The deckbuilding elements are implemented well, with an equally impressive set of skills which can be combined in inventive ways to make your character even more powerful. The combat is fast and furious, with lots of bosses, clever enemies and traps to test your skills while there are also mysterious quests to keep you on your toes. Forced Shutdown is a pretty solid entry into the arena-based combat genre. The action is rarely less than entertaining and doesn't get as repetitive as you might expect, which is in part attributable to the deckbuilding aspects and the sheer variety of arenas and enemies. The controls are fairly easy to pick up, so whether you're a newcomer to this sort of thing or an old-hand you should be fine here. The visuals too are pretty slick, with lots of colorful environments and characters to discover and which help make this an enjoyable experience.